Benchmarking is the process of comparing your own organization, operations, or processes against other organizations in your industry or in the broader marketplace. Benchmarking can be applied against any product, process, function or approach in business. Common focal points for benchmarking initiatives include: measures of time, quality, cost and effectiveness, and customer satisfaction. The intent of benchmarking is to compare your own operations to that of competitors and to generate ideas for improving processes, approaches, and technologies to reduce costs, increase profits and strengthen customer loyalty and satisfaction. Benchmarking is an important component of continuous improvement and quality initiatives, including Six Sigma. Why Should Your Firm Benchmark? The case for benchmarking suggests that a particular process in your firm can be strengthened. Some organizations benchmark as a means of both improving discrete areas of their business and monitoring competitor's shifting strategies and approaches. Regardless of the motivation, cultivating an external view of your industry and competitors is a valuable part of effective management practices in this world that is constantly changing. The most common driver for benchmarking comes from the internal perspective that a process or approach can be improved. Organizations will collect data on their own performance at different points in time and under different circumstances and identify gaps or areas for strengthening. Many organizations compare themselves to competitors in an attempt to identify and eliminate gaps in service or product delivery or to gain a competitive edge. The data gathered in a competitive benchmarking initiative offers specific insights into a the competitor's processes and thinking. The term: strategic benchmarking, is used to describe when a firm is interested in comparing its performance to the best-in-class or what is deemed as world-class performance. This process often involves looking beyond the firm's core industry to firms that are known for their success with a particular function or process. 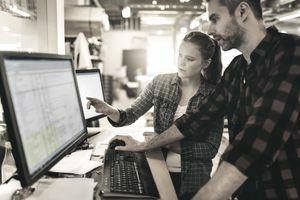 While it's important to measure and monitor performance for all critical business processes, organizations should be wary of taking action based solely on an inside or insular view of their operations. A firm that is preoccupied with itself easily loses track of competitors and broader-world innovations and the changing demands of customers. Looking beyond your own industry for the best-in-class performance of particular processes or functions is an excellent way to challenge your firm to rethink long-standing assumptions and practices. For example, Southwest Airlines famously analyzed the processes, approaches, and the speed of automobile racing pit crews to gain ideas for improving their airplane turn-around time at the gate. The outcome of this benchmarking study is reported to have helped Southwest reconfigure their gate maintenance, cleaning, and customer loading operations, and to have saved the firm millions of dollars per year. Many industries or industry or consumer related organizations publish comparative data invaluable to the benchmarking process. For example, consumers interested in the quality of new or used cars can look to the organization that publishes Consumer Reports for their detailed testing and reporting results on new and used cars. A firm interested in improving their customer service practices might compare their own processes and metrics against those of their most successful competitor. If they identify negative discrepancies or differences in measures, they may embark upon process improvement to strengthen their performance. The firm will observe and measure the competitor's operations, and in some industries, they will send in employees as customers to gain direct experience. A quick service restaurant chain, dependent upon speedy, accurate service in the drive-thru to maximize efficiency, cut costs, and increase profits, will study the drive-thru practices of key competitors. Every second gained without sacrificing customer quality allows the firm to increase profits. Over the years, competitors have consistently innovated in their drive-thru operations with configuration, the number of windows, menu and speaker boards and ordering approaches in an attempt to improve in this area. They are constantly watching and benchmarking against each other. One firm, Pal's Sudden Service, a small hamburger and hot dog chain and a Baldrige Quality Award winner, is so successful at achieving best-in-class performance for drive-thru and overall restaurant operations, that it opened an educational institute to train other organizations. Many companies in the fast food market use Pal's as a best-in-class benchmark for their own firms. Benchmarking is a potentially powerful tool to promote continuous improvement in an organization. However, relying on internal-only measures breeds a myopic perspective. High performing organizations strive to identify processes, functions, or offerings that are important to their businesses and evaluate their efficiency and effectiveness versus leading competitors or leading innovators. Care should be taken to define benchmarking initiatives deliberately and scientifically, or the results could be misleading.